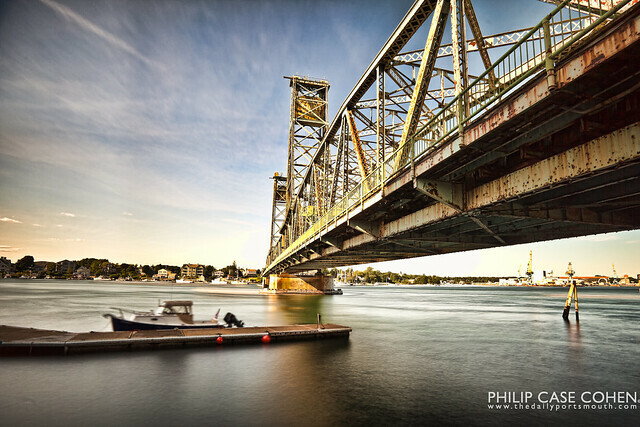 The fate of the Memorial Bridge is still in question, and the bridge replacement plan has been in the news for the past couple weeks again – as the Maine-New Hampshire Bridge Connections Study will be due to both states (at a cost of $1.5 million to complete) sometime around August. It’s sounding like the Memorial Bridge will come down and be replaced, as its life span has been reduced to one year by safety engineers. I’ll definitely miss its craggy & rusty appearance hovering over the Piscataqua River…and I’m very curious to see what might go up in its place. In the meantime, I’ll be sure to take a few hundred or so photos while I still have the opportunity – and encourage you to do the same. This was one of the very first exposures I ever took with my new 10-stop Neutral Density filter. Thanks to the filter – you can see the bridge structure nice and sharp while the dock and the water has much more blur due to the flow of the river and the movement of the dock & boat.